I try to keep the bird bath clean. 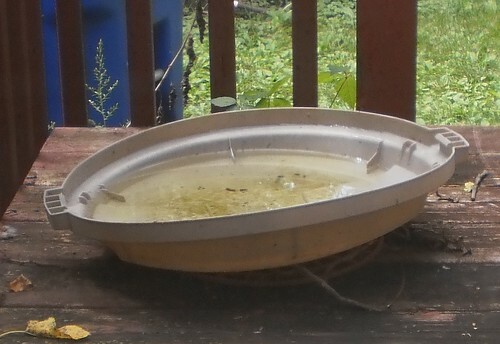 When I was actively feeding the birds, I read up on bird baths. Having a source of fresh water in your yard means birds will hang around. They bathe in it as well as drink it. I've seen robins and cardinals bathing although they disappear when I try to photograph them. I regularly dump and replenish the water particularly if it gets dirty. I've wondered how it could get so dirty and green sometimes when it's been a mere two days since I refilled the bath. Yesterday, as I was reading the live feed for the football game, a robin came by to take a bath. He had himself a grand old time, splashing around. The camera was, of course, in the living room, so I just watched. As he prepared to leave, he stood on the side of bath and pooped into it. All right then. That explains why the water looked like crap. On the agenda today, replace the water and scrub out the bath.